Did you know that the “Master Roaster” at The Vashon Island Coffee Roasterie has been roasting beans on Vashon for over 30 years? Over 30 years ago, Master Roaster, Peter Larsen arrived from Germany with the hopes of putting his extensive knowledge of coffee roasting to good use. A fourth generation roaster who grew up around and apprenticed within the exacting German coffee industry, Peter was quickly discovered by Jim Stewart, founder of Seattle’s Best Coffee, joining him on Vashon at what is now The Vashon Island Coffee Roasterie. Peter’s experience was the perfect accompaniment to Jim’s desire to introduce Northern European style coffee roasting to the United States and improve the quality of coffee available in this country. Little did Peter know he would become a key part of a significant era of coffee history: helping to create the specialty coffee industry, establishing Seattle as the capital of today’s worldwide coffee phenomenon and putting our little Vashon on the coffee map in a big way. PL: I grew up around and working in my mother’s family business in Hamburg, Germany. They roasted coffee, nuts, spices, you name it. Q: Hand roasting coffee is a complex process combining art, science and the senses. Is there are a part of the process you enjoy the most? Q: What are the greatest challenges you face? PL: Finding and buying the best beans available at a competitive price on a regular basis and roasting consistently. Q: How have things changed since you started out 40 years ago? PL: There weren’t many good beans available back then, especially here in the USA-just Columbian and cheap Brazilian beans. Roasting was not an art. The technology of roasting and understanding coffee has really improved. 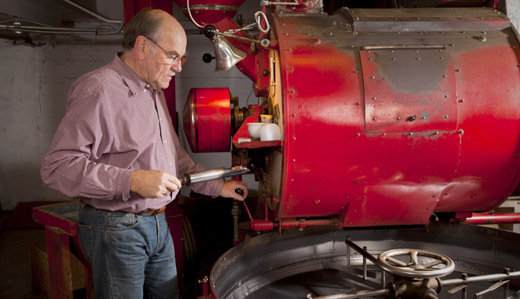 Q: What are your earliest memories growing up in a family of roasters? PL: I would spend hours watching the old roaster guy at the old Probat roaster. In Germany at that time, they roasted everything light so there was not much of a shine on the beans. The roasters would spray some kind of powder on the beans during the cooling process that gave the coffee some shine. That always stuck in my head! Q: Any coffee roasting “nightmares” or stories you’d like to share? PL: One of our roasters liked to work alone very early in the morning. He had a batch in the roaster when he stepped outside to check the afterburner. A gust of wind shut the door and he didn’t have a key to get back in. I got a call and raced up there with a key. By the time we got inside, the beans had turned to ash and the roaster was glowing it was so hot…but it was still running. What a great machine. That was really something. Q: What is the most important part of creating an excellent cup of coffee? PL: Making a perfect cup of coffee involves many hands and steps. From how the coffee was grown, when it was picked, how it was processed and dried, how it was shipped, roasting, and, last of all, the brewing process. Each of these steps is equally important to the final flavor of the coffee. Q: How does one study to become a coffee roaster or learn more about coffee? PL: I don’t know of any accredited coffee roasting schools here in the United States. I would suggest going to Germany. In Germany, there are apprenticeship programs that take about three to four years to complete. I have created my own program here at the Roasterie and am passing on my knowledge and experience to our apprentice roaster, Casey DeLoach.